Mobile Windshield Rock Chip Repair Near Me - We Come to You! Call Windshield Repair Doc today! 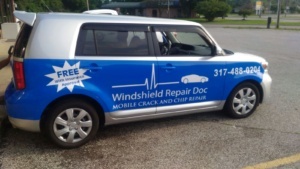 Mobile windshield rock chip repair near me will save you tons of valuable time! Many companies will fix your rock chip but only if you bring your vehicle to their location. You can end up spending hours just waiting on a windshield rock chip repair that can be done within 20 minutes. Because we know your time is valuable, we come to you! Why Choose Windshield Repair Doc for your Mobile Windshield Rock Chip Repair Near Me? 1- Any Location –Windshield Repair Doc will come to any location within the greater Indianapolis service area. We will come to your work location, home location or even your kid’s soccer game location. 2- Short Window -We will schedule a time that works best for you! And unlike our competition, we will not give you a 4 hour window and then never show up. We will give you the shortest window we can (usually 1 – 2 hours) and we will call you when we are on our way. 3- Lifetime Warranty on all chip repairs – We are so confidant in our work that we offer a lifetime warranty on all repairs. If the chip should ever crack out during the lifetime of the windshield, we will refund you the money you paid for the repair. 4- We Specialize in Windshield Chip Repairs– Because we ONLY provide windshield chip repair service and NO replacements, we make sure the job is done right, right away. 5- We offer a ‘Free with Insurance Option’. – Who doesn’t want to save money? Read about our Free with Insurance Option here. If you get a rock chip on your windshield, get it fixed right away. By getting it repaired before it cracks out, you will avoid needing a windshield replacement. Why Choose a Locally Owned Company? We offer Lifetime Warranties on each repair!